What’s going on here people? 60 something degrees over here in New York this Sunday. I kind of liked it. Okay, we’re not going to get into the whole global warming thing but I could definitely embrace a warmer winter on the work front. That’s my own selfish reason anyway. Welcome back to another edition of the Hobbit Hollow Construction Blog, by the way. So glad you took the time to come back! Had a little wrench thrown into the gears this weekend. Had to take the 760 crane down this Saturday over on 58th street. The 760 was the first crane we installed there to start the job. Then we put a 440 in to build the tower. We still have to put a 220 in to build the smaller building we call “the villa” on 59th street. That should be in another 2 months or so. The architect is taking a long time to put the drawings together. Here’s a picture of the boom being hooked up. The job on the right is being done by another concrete company. 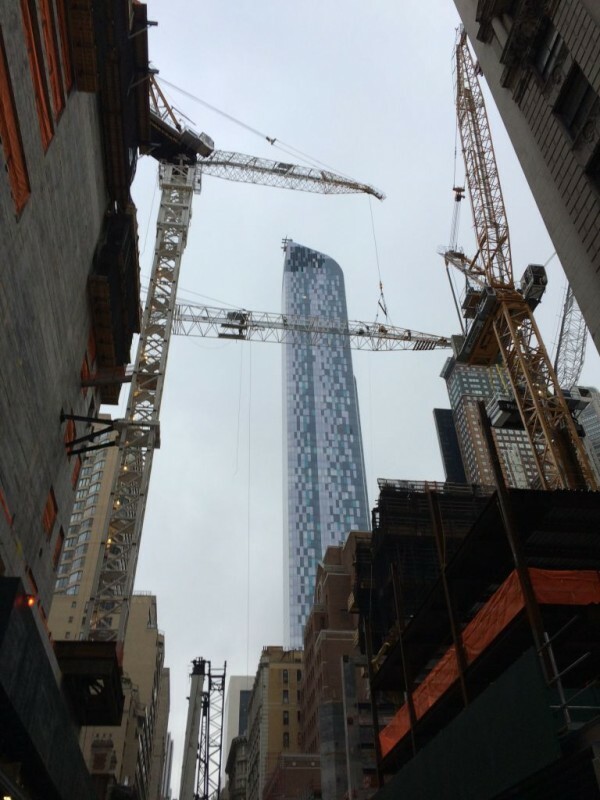 It will someday be the highest residential tower in the Western hemisphere. I don’t know if you have ever heard of it before but 58th/57th street is now being called billionaires row. That’s because billionaires are the only ones who can afford the apartments. Oh well. I’m not interested in living there anyway. Although with the Powerball lottery jackpot at 1.3 billion maybe I will have a shot. Hey, you never know. Side note for anyone interested. The tower that is in the background is called One 57. During hurricane Sandy the boom of the crane that was working that job flipped backwards over itself and was hanging off the building. Back to the electrical install at the Hobbit House. Well, before we go there I just gotta touch base on the whole lottery thing. So the Powerball lottery drawing this Saturday was 900 million dollars….and nobody won. They are predicting that the next drawing will be on the order of 1.3 billion dollars. That’s a lot of Hobbit House people. In our discussion of what we would do if we won this prize I mentioned that then we could have someone finish the Hobbit House. Boy did I get a reaction to that! Apparently we have to finish the house ourselves no matter what the outcome of the lottery drawing. The boys feel like they spent too much of their blood, sweat, and tears to let anyone else put their hands on the finishing touches. Hmmm. Let’s win the lottery first and then we’ll revisit that conversation. 1.3 billion. That’s a lot of cash. Quick story: Georgia has never played the Lotto before. So she was asking where do you buy a ticket? I said you just go to the beer and soda store down the road and pick up a ticket there. 1-2-3 done. Then she says, “So if you win you just pick up a billion dollars over at the beer and soda place?” Well that set off quite an animated discussion about lottery winning pickups. Her brothers were ruthless. It was quite funny though. Especially the line about the beer and soda place transforming into a red carpet Lotto center with TV cameras and the like. Hmmmm. I guess you had to be there. Back to Hobbit House electrical Jim. Please. I met with Ethan and Jude over at the house and went over a bunch of odds and ends that have to get done. 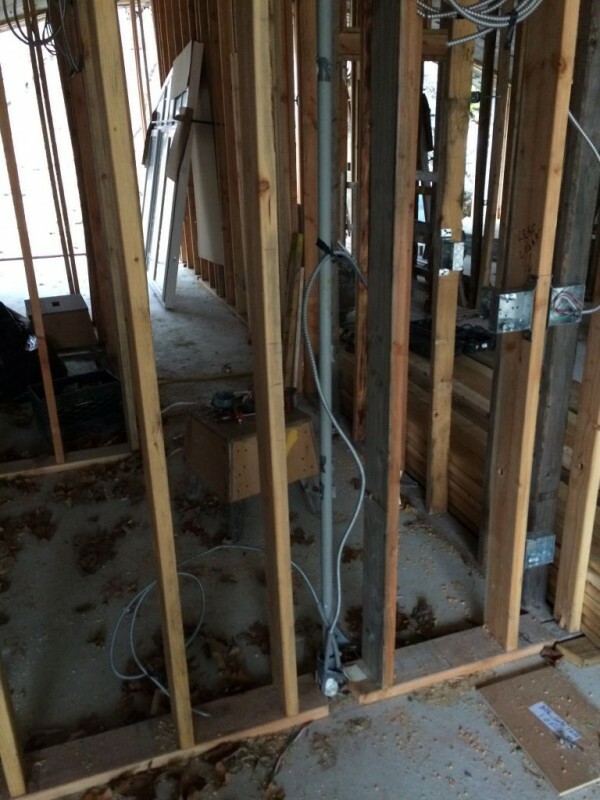 You know, running wires, prepping boxes, installing grounding wires. Also using lineman pliers, needle nose pliers, wire strippers, and the like. There’s actually a lot of little stuff to it which I don’t have time for today but we will get to it. A couple of pictures. 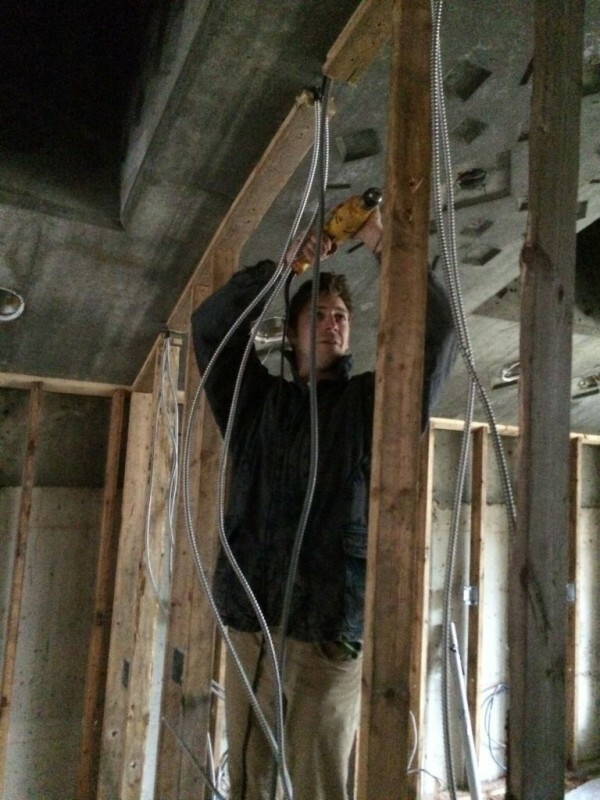 Ethan drilling extra holes for running the wire. Octagonal wall mounted box for a lighting fixture. Home runs held in place with pvc pipe to be removed later. So if you remember, we ran all the circuits for the house in the slab. One end starts at the panel box the other goes to wherever that circuit happens to be . This picture shows the bathroom lights and the bathroom outlet circuits that were held off the ground by that grey piece of pvc pipe. Now we just have to wire those two circuits in place and we’re done. 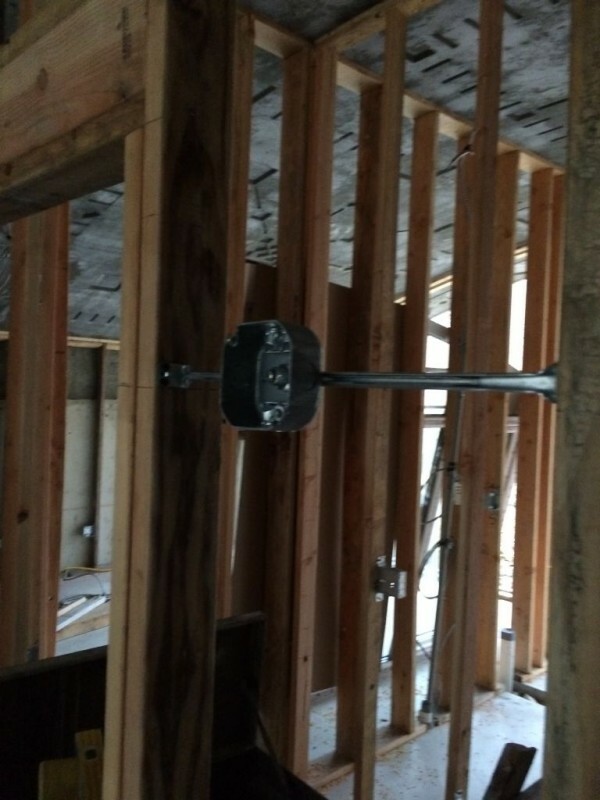 Usually you have to run the home runs back to the panel box through all the existing studs. So one of the most difficult and time consuming parts of the rough wiring is already done. Well I’m completely out of time people. If you haven’t picked up your lotto ticket yet: Now’s the time! Hey, you never know.